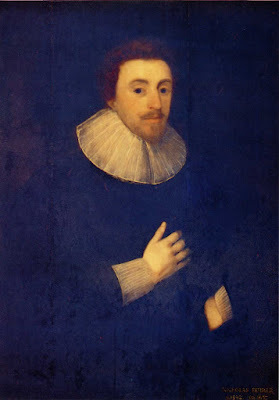 Nicholas Ferrar, together with the wider family, moved to Little Gidding after the collapse of their merchant business. On arrival they found the church used as a barn and the house, uninhabited for 60 years, in need of extensive repair. The household grew to about 40 in number. A school was established for the children of kinsmen and friends and family. One wing of the house became an almshouse for four elderly and infirm women. A dispensary was set up in the house to provide broth and medicines to the local people. Nicholas was ordained deacon and he established regular prayer and established matins, the litany, and evensong. He also began a round of hourly devotions in the house, augmented by nightly vigils. Nicholas devised a Harmony of the four gospels. Individual lines were cut from the four gospel narratives and pasted together to make one continuous text and the pages were also illustrated with engravings. When King Charles heard of the Harmony’s existence, he borrowed it, returning it only when the family agreed to make another for him. The family also made others for family and friends as well as for other royals and members of the nobility. Fifteen volumes survive, four in the British Library. The Ferrar household was an example of a godly family, neither unique nor monastic, but firmly committed to the Church of England and its Prayer Book and to God’s service. Their pattern of life placed them in a middle way. The church at Little Gidding, with its reading desk and pulpit carefully placed at equal heights on either side of the church, expressed their vision of an appropriate balance of liturgy and preaching, a balance of tradition and scripture, interpreted by reason, that remains the heritage of the present Church of England.